111%, the creators of BBTAN game series recently released a brand new mobile game BTS Craft – Boxer, Tower, Spell. BTS Craft game features over 100 challenging stages, lots of attacking units, amazing graphics, and simple gameplay. If you are having trouble getting victories or you are not getting 3-stars, then we are here to guide you. In this post, we have shared BTS Craft guide and BTS Craft tips, cheats & strategy. In BTS Craft game, your main objective is to destroy the enemy base and protect your own base. Initial stages are very easy to complete. But as you progress in this game, the difficulty level will increase and it will be hard to get three stars at every stage. If you get three stars in a stage, you will earn rune(in-game item) and a huge amount of coins. In the battle, you just have to drag & drop the units; boxer, spell, and tower. Read the cheats, tips part below and learn how to win battles. You can use coins in upgrading the units and base. On the main screen -> tap the upgrade option -> level-up the units & base. Leveling up increases the power and performance and you will be able to win battles easily. Repeat old stages to earn more coins. 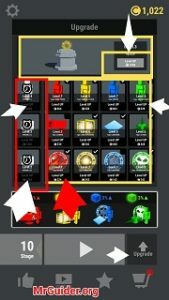 Let’s start the BTS Craft tips, cheats & strategy guide. In these type of games, you should have basic knowledge about the units. Because all the units have different stats, skills, and attack style. And without having proper info, you will not be able to utilize the units in the battle. Let’s learn about the units. BTS Craft game features four boxers. You can opt up to three boxers in the battle. Among all these boxers, the green boxer is locked in the beginning. You can unlock it by watching five video ads. Go to the shop tab -> scroll down and there you will see “free green boxer” option. These boxers are attacking unit and you deploy them on the battlefield to destroy the enemy base. The player can select up to 3 boxers for the battle. Go to the upgrade tab and check the box(top-right corner – boxer’s icon). Then replace it with one of the team members. You just drag & drop the spell where you want to use. For instance; use power buff on the boxers, poison or lightning or meteor spell on the enemies. Blue boxers are very fast, but their HP is not quite good and due to this, they get die early. And yellow boxers and red boxers deals good damage to the enemies, but their speed is slow. Since blue boxers have low HP stats, they will not be able to move on because of enemy towers. First, strike down the towers and then send them. Make sure to use spell wisely. For instance, use the power buff on a group of boxers. Use the meteor spell on the enemy’s base. Poison and Lightning spell on the enemies. As you know, you get units after every few seconds. You can reduce the spawn time and get the unit fast by leveling up the clock. Go to the upgrade tab and level up the timer/spawn time[See the picture above]. In BTS Craft game, your main objective is to destroy the enemy base. But if you lose own base, your game will be over. So, upgrade the base and increase its HP. [See the picture above]. 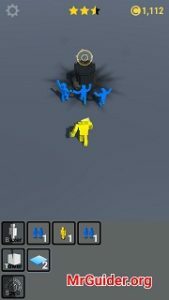 To protect the base from enemies’ attacks, put the towers such as Cat-Cus, Cannon, and Land Mine around the tower. After getting the victory in the battle, you will get coins. Double the reward by watching a video ad. Spend the coins in upgrades. You should wait for the next unit. For instance, after the battle starts, you get a red boxer. Don’t deploy it instantly. Wait for the next unit. Because when you get the same type of unit again, that unit will level up. For instance – 1 Red Boxer + 1 Red Boxer = Stronger Red Boxer. Similarly, wait for the spell & tower units. So these are some BTS Craft tips, cheats & a strategy guide for the beginners. Download BTS Craft game – Here(Google Play Store).